In St. Raphael’s, we are delighted to announce that we have been awarded our 4th green flag for sustainable travel. This means we are great at recycling, conserving energy, saving water and coming to school an environmentally fridendly way. Well done to everyone for their hard work. 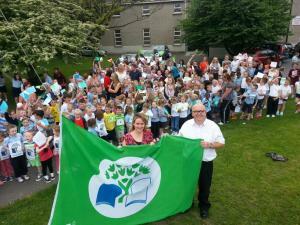 As a school, we were so proud to raise our 4th green flag with the help of Councillor Vincent Jackson in June 2014.